Ace Of Clubs Birth Card. Destiny Cards Free Reading. 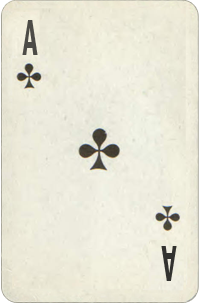 The Ace of Clubs is one of the four special semi-fixed cards. People born on the Ace of Clubs birthdays are the best-informed people in their circle of friends. There is nothing much to escape their attention. The Ace of Clubs is a born leader, one who knows better the actual reasons behind people actions and willing to share his or her knowledge with others. The Ace of Clubs seeks many channels of expression. Their mental abilities are incredible and so their drive for learning about life. They have an extraordinary vision for all kind of metaphysical studies, either they accept it in themselves or not. The Aces of Clubs have a magnetic charm that drives the public to them. The Ace of Clubs is a positive thinker, quick, witty and aggressive debater. The best way to learn for them is a good argument. Strong desire for self-expression may start to manifest in their early childhood. For most Ace of Clubs people, mother plays a vital role in creating their strong character and stimulates their quest for finding their own identity. Quick and passionate tempered nature will never stand slow environment and will cause arguments with teachers, or any people in charge. The Ace of Clubs person is born for the professional success. Working with groups of women, or in any area interconnected with beauty and home are the prominent fields to apply their talents. These are people of the big picture. They plan for a long-term, and often against anything that limits their horizons. Working as an employee might be a challenge. The Ace of Clubs may find it difficult to settle down in any place for long. Restless and energetic nature suggests the desire for change. With all, their dominant and bright character, the Ace Of Clubs are flexible in their thinking, and that gives them great ability to adapt fast to any circumstances. Travel and a variety of experiences at work can add significantly to happiness. The Ace of Clubs natural curiosity is apt to lead them to an interest in psychology and metaphysics. This will benefit a lot later in life, and also others because with their enlightened understanding they can help others to see the truth. Choosing right people and friends is very important if the Ace Of Clubs want to be as well appreciated as they deserved.